India’s decision to invite private capital to participate in the modernisation of its metro airports has delivered significant benefits for passengers, airlines and the government. The two leading private promoters involved in the sector, GMR and GVK, have implemented dramatic improvements in airport infrastructure at Delhi, Mumbai, Bengaluru and Hyderabad which have transformed the passenger experience, improved efficiency and capacity for airline operators, and delivered a massive dividend to the state-owned Airports Authority of India. However, there are important issues to be addressed with respect to the impact of significantly higher charges on airlines and passengers. And lingering uncertainty about the economic regulatory framework, as well as the broader operating challenges in the aviation industry in India, has also made some investors wary. Lessons from the PPP experience will need to be factored into future projects to prevent such challenges from recurring as a second wave of modernisation is expected to commence shortly. In this short extract from CAPA's comprehensive 300-page India Aviation Outlook Report we review some of the key issues associated with the privatisation and development of airports in India. The full report will have critical details on new projects, greenfield developments, low cost airports, privatisation programmes, capex requirements, airport strategies, financial performance, central and state government plans, policy and regulatory developments and airline risks. For any company with an exposure to or interest in Indian airports this is the invaluable guide to the sector. For more information contact Vishal Bhadola on +91 11 4692 1052 or vb@centreforaviation.com. Advance purchase discounts are available. The four major PPP airports in India are Delhi and Hyderabad (both operated by GMR-led consortia) and Mumbai and Bengaluru (both operated by GVK-led consortia). These four airports accounted for 53% of total passenger traffic handled by Indian airports in FY2014. 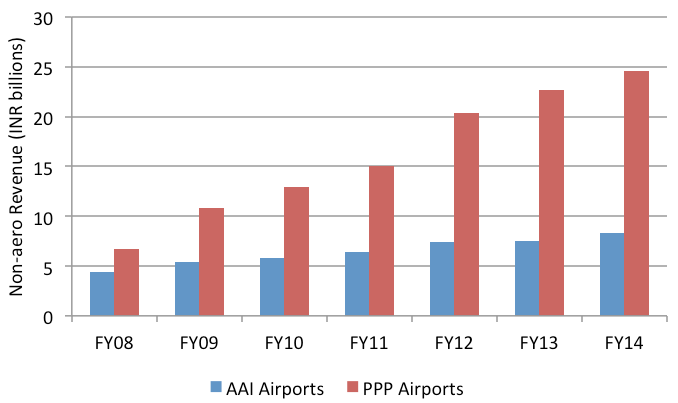 Under the PPP concession agreements the airport operators are required to pay a specified share of gross revenue to the state-owned Airports Authority of India (AAI); this share varies by airport. 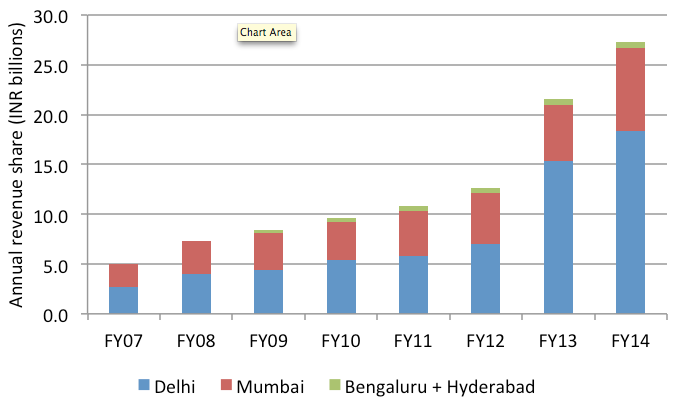 Since FY2007, the four private metro airports have delivered a massive dividend of USD1.72 billion to the AAI. The annual amount payable to the AAI has been growing rapidly each year and in FY2014 it reached close to USD460 million. This goes directly to the AAI’s bottom line as the authority incurs no expenses in relation to the PPP airports. Even after the AAI received USD460 million in revenue share, CAPA estimates the Authority reported a profit of around just USD135 million in FY2014. And approximately 60% of this profit was actually contributed by air navigation services and not by airport operations. For some time now it has been intended that the air navigation services division would be corporatised, a step that is vital for the long term future of airspace management in India. However this is expected to be delayed further because of the impact that corporatisation would have on the financials of the airports division. It has become increasingly apparent that without the PPP airport revenue and air navigation services the AAI’s business model is unviable. The private airports are achieving strong revenue growth due to a combination of increased traffic, higher aeronautical charges and the development of non-aeronautical revenue opportunities which have been poorly leveraged by the AAI in the past. The four private metro airports handle around 15% more passengers than all the AAI airports combined but their non-aero revenue is approximately three times as much and the gap is increasing. The AAI has strong capabilities in airport development and operations; however its lack of commercial orientation is hurting the economies of key cities and destinations in the country – such as Chennai, Kolkata and Goa – due to its inactivity in terms of attracting passenger and cargo services. The failure to focus on the requirements of airlines can be seen in AirAsia India’s recent decision to switch its hub from Chennai to Bengaluru. Chennai will almost certainly lose its position as India’s third largest airport to Bengaluru this year. CAPA India Aviation Outlook will have detailed information on airport-wise financial performance including aero and non-aero revenue trends. In Sep-2013 the AAI announced plans to award PPP concessions at six airports – Chennai, Kolkata, Ahmedabad, Guwahati, Jaipur and Lucknow – with a further nine airports to follow. However the tender process has been stalled for several months due to a lack of preparedness with respect to the concession agreement and the revenue sharing and tariff structure framework. Following the general election the new government has yet to indicate how it intends to proceed. Despite the successes of the first wave of PPP airports there are certainly areas for improvement, particularly in terms of economic regulation, land monetisation, management of project costs and at a broader level creating a more predictable operating environment on issues such as bilateral policy, airspace efficiency and airline viability. Increased charges at PPP airports have certainly been a contentious issue for airlines. On some domestic sectors for example approximately 17% of the average gross fare now consists of taxes and fees, of which 10-12% is related to airport charges. A clear process has not been established for determining the appropriate level of capital expenditure in airports and for monitoring project costs to prevent the massive budget over-runs that have occurred in some cases and which have simply been recouped through higher charges that are borne by the airlines and passengers. The award of concessions at Delhi and Mumbai was conducted in the absence of a defined economic regulatory framework and hence there is a continuing debate between the airport operators and AERA on whether a single, hybrid or dual till should be applied. AERA’s stated position is to apply a single-till approach, however the Ministry had subsequently indicated that it planned to introduce a policy specifying a hybrid-till. Up until the time the general election was called in Mar-2014, the PPP airport operators were expecting a hybrid-till policy to be announced, but this did not happen. On present indications a hybrid-till appears unlikely and AERA is expected to continue with the single-till framework. A key source of frustration for airport operators has been the length of time taken for the tribunal to clear their tariff proposals. 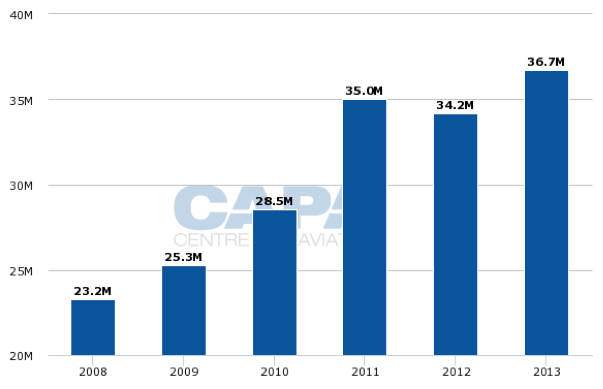 CAPA India Aviation Outlook will have detailed analysis on the impact of the single-till on the current PPP airports. Most Indian airlines have been facing an extended period of financial stress. This has not only had an impact on airport cashflows as a result of delayed payments of aeronautical charges in some cases, but it also heightens network and capacity risks. The exit of Kingfisher for example, an airline which not long before its demise had a domestic market share of 20%, was felt by airports across the country, but particularly in Bengaluru where it was the largest carrier. With risks at certain airlines peaking there will undoubtedly be concerns about the potential impact of airline failure. India’s bilateral policy has oscillated over the last decade between rapid liberalisation and freezing of access. Such decisions have been made in an arbitrary manner making it difficult for airports to develop a long term plan. The government has at times indicated that it wishes to provide Delhi and Mumbai with a framework to support the development of strong domestic-international hubs, but has then proceeded to open up market access for foreign carriers to additional non-metro points of call, allowing them to by-pass Indian gateways. Although Delhi and Mumbai would obviously prefer that such access is not granted, if it is to be the case the airport operators would rather know ahead of time. The challenge that they have faced is that key decisions instead take place in the absence of a clear plan and without industry consultation. In a sector with high capex requirements and long project gestation periods, forward visibility about potential traffic flows is critical. CAPA India Aviation Outlook will present the latest status of India’s bilateral aviation policy and analysis of the impact this could have on traffic at key airports. Goa is India’s wealthiest state on a per capita basis and one of the country’s leading tourist destinations. In FY2014 it received 1,128 foreign charter services, approximately 90% of the charter operations to India. However, its airport is constrained by the fact that it operates as a civil enclave within an Indian Navy facility. This imposes certain operating restrictions (no civilian movements are permitted between 08:00 and 13:00 on weekdays) and limits the amount of land available for expansion. The AAI recently inaugurated a new integrated domestic and international terminal which has enhanced capacity and the passenger experience, although some service issues remain. However, this facility could saturate within the next 5-6 years – and that is without a pro-active commercial push to attract new services, it could be even sooner with concerted airline marketing initiatives. The AAI’s lack of route and traffic development is hurting Goa’s economy as a result of its impact on tourism, its largest industry. A plan to develop a second airport at Mopa in the north of the state has been in the planning stages for several years. The state government is in favour of the airport, however progress has been stalled due to objections from hotels and tourism operators in the south of the state on the basis that they would be disadvantaged by the location of the airport, although the intention is for the current airport to continue to operate. Ideally the existing airport would also be privatised in order to usher in a more commercial approach, however its civil enclave status may preclude this. However, following the general election result in May-2014, the same party is now in power both at the state and central governments, which could result in the project being fast-tracked, although several hurdles remain. Nevertheless Request for Qualification documents could be issued shortly. CAPA India Aviation Outlook report will present analysis of the shortcomings of the current airport in Goa; its impact on the local economy; why a second airport at Mopa is necessary and how best to leverage its potential. In the case of India’s most significant, but repeatedly-delayed greenfield project at Navi Mumbai, Request for Qualification documents were finally issued on 5-Feb-2014, although a Request for Proposal document is not expected to be sent to short-listed parties until at least Sep-2014. But the project continues to face a number of challenges. These relate to land acquisition, the need for complex preparatory earthworks at the proposed site and the absence of convenient surface connectivity between Greater Mumbai (home to the majority of the residents in the Mumbai Metropolitan Region) and the airport. Further delays are likely and as a result the airport is unlikely to be operational until at least 2020 which would mean that the current airport could be saturated for 2-3 years before the new airport opens. Meanwhile cost estimates continue to be revised upwards as the complexities of the project become more apparent. CAPA projects that there will be a significant further increase in costs once the concession is awarded to the successful bidder and the private consortium develops its plans based on more realistic assumptions. CAPA expects that the issues associated with the project will as a result diminish investor interest in the airport. This is expected to be advantageous for GVK, the operator of the current Mumbai airport, which in any case has the first right of refusal to match the highest bid and win the concession should it be within 10% of the bid. GVK has indicated strong interest in securing this concession. CAPA India Aviation Outlook will have further details about the challenges associated with the Navi Mumbai Airport project as well as the implications of the current airport reaching saturation. The report will also address the status and outlook for other greenfield airports such as Kannur and Aranmula. The government had asked the AAI to prepare a plan to develop 50 airports across India to encourage regional connectivity. This is, in principle, a good idea but bringing the vision to reality requires a more convincing and better thought out plan. Since the AAI currently has 50 idle airports and a further 60 loss-making operational airports in its portfolio it is not clear that constructing additional infrastructure should be the authority’s priority. Especially as there has been significant investment in high profile airport rehabilitation in recent years at locations such as Mysore, Pondicherry and Kanpur which have failed to attract airline services. A private greenfield airport at Durgapur has similarly struggled to secure the interest of airlines, and Reliance was unable to operationalise its regional airports in Maharashtra. State government initiatives in Maharashtra and Karnataka have not managed to gain traction either. New airport infrastructure should be supported by realistic business plans and be linked to the regional airline strategy. The success of such airports – and the extensive economic benefits to the local community – is ultimately dependent upon ensuring the viability of airlines that can operate there. CAPA India Aviation Outlook will identify the steps that need to be taken to make unused airports operational and the key success factors for low cost airports. It will explore in detail the core reasons why numerous regional airports have failed to attract services. The report will present the challenges to the viability of regional airlines and how they can be addressed; and the role of state governments and local business in ensuring their success. Delhi Airport has emerged as India’s busiest since 2010 and it continues to be the airport with the greatest hub potential in the country. Air India’s entry into Star Alliance this week, the launch of Tata-SIA later in the year and the commencement of A380 services by Singapore Airlines and shortly Emirates will all support continued expansion at the airport. However, despite strong growth in traffic volumes the airport’s financial performance has been mixed due to challenges in the operating environment and because the airport’s potential has not yet been fully leveraged due to strategic issues. At GMR’s other Indian airport in Hyderabad the regulator’s ruling that it cannot continue to levy a User Development Fee will cost the airport INR6 billion (USD100 million) over the next two years. This will intensify Hyderabad’s challenges just as it is seeing increased competition from a recently expanded Bengaluru and the possibility of a private operator coming into Chennai. As of Jun-2014 the state of Andhra Pradesh, of which Hyderabad is the capital, was split into two, Telangana and Seemandhra. Hyderabad is located in Telangana however GMR may have started discussions with the government of Seemandhra to manage the two largest airports in the new state, Vizag and Vijayawada. GMR’s investment in the second airport in Istanbul, Sabiha Gokcen, proved to be very successful and the company realised a 25% rate of return when it disposed of its 40% stake in FY2014. Its other overseas concession, at Male Airport was unexpectedly terminated by the Maldives government in 2012. The matter has been the subject of arbitration in Singapore and in Jun-2014 the tribunal ruled in favour of GMR stating that the agreement was ‘wrongfully repudiated’. GMR is seeking compensation from the Maldives government. Meanwhile GMR has a 40% stake in the consortium which was successful in bidding for the concession for Mactan-Cebu Airport, the second busiest in the Philippines. GMR Airports is likely to proceed with an IPO in FY2015 subject to market conditions. Further details will be in the CAPA India Aviation Outlook. The opening of T2 at Mumbai for international operations in Feb-2014 was a significant milestone, providing India’s commercial and financial capital with a world class terminal. Once domestic services are brought under the same roof from later this year the airport will become much more attractive to transfer passengers. Monetisation of the land bank at Mumbai is also expected to commence soon. As stated earlier, Mumbai International Airport Limited is expected to be the front-runner in the Navi Mumbai Airport tender. GVK Airports also operates Bengaluru International Airport where in FY2014 it completed the extension of Terminal 1; this has relieved congestion and enhanced the passenger experience. The additional capacity will support traffic growth that should see it overtake Chennai to become India’s third largest airport during FY2015. GVK Airports would then be in the strong position of operating India’s second and third largest airports. Bengaluru Airport’s success in convincing AirAsia India to relocate its initial base from Chennai to Bengaluru is an indicator of the operator’s commercial focus. GVK Airports has also enjoyed recent success overseas having been awarded the concession for a second airport in Bali. This could lead to the operator pursuing further opportunities in Indonesia and elsewhere. GVK Airports is seeking to deleverage itself by raising USD400-500 million in equity. The capital will be required not only for debt reduction but also for Navi Mumbai, should GVK be successful in its bid, as the project will require significant capital. Due diligence is underway. However, achieving the expected valuation may be challenging unless a strategic investor can be secured. CAPA India Aviation Outlook will have critical details on new projects, greenfield developments, low cost airports, privatisation programmes, capex requirements, airport strategies, financial performance, central and state government plans, policy and regulatory developments and airline risks. For any company with an exposure to or interest in Indian airports this is the invaluable guide to the sector. For more information contact Vishal Bhadola on +91 11 4692 1052 or vb@centreforaviation.com. Please ask for an advance purchase discounts.